Shilpa Shetty Kundra has been known to have an envious wardrobe. Right from elegant ball gowns to perky jumpsuits, Shilpa Shetty's sartorial choices have been a treat to sore eyes. With a chiselled figure to die for, the fitness goddess can make anything she wears look so good that it almost seems like she owns a fashion magic wand. However, our diva also has equally good taste in the desi attires she chooses to wear, especially sarees. 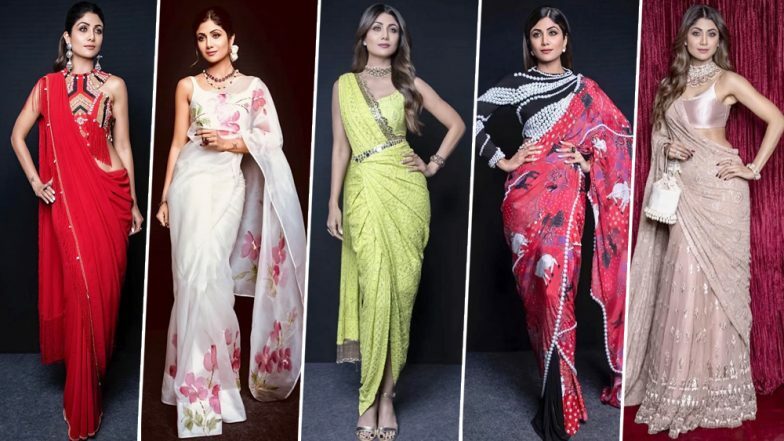 Not only does she wear sarees that complement her figure but also her sarees are usually very unique, something that only Shilpa Shetty can pull-off. You and I can only dream about these quirky sarees that the gorgeous beauty carries like a piece of cake. Her sarees are mostly of vibrant colours with out of the box blouse cuts, and belts that give the attires a crisp edge. Well, we cannot deny that Shilpa has an unusual sense of fashion, when it particularly comes to sarees. Shilpa Shetty to Launch Her Health App: Pictures and Videos to Prove That Actresses the True Fitness Diva in B-Town Who Cheats Like a Pro. Isn't this what a fabulous dream would look like? Simple red saree with a chunky belt and she can kill it! Shilpa Shetty is a whole package! Right from her fitness routines, to her yoga poses to honestly, her Sunday binges and HER WARDROBE... we can only wish if we were her!